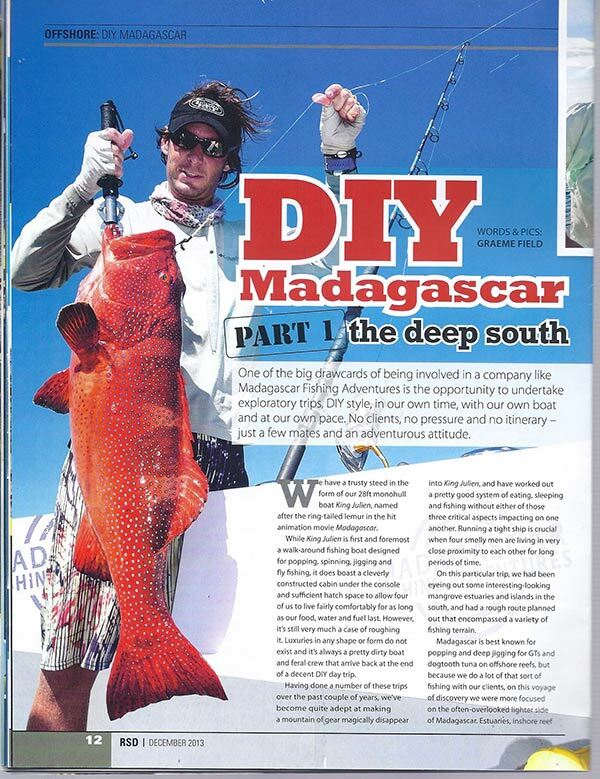 One of the big draw cards of being involved in a company like Madagascar Fishing Adventures is the opportunity to undertake exploratory trips, DIY style, in our own time, with our own boat and at our own pace. No clients, no pressure and no itinerary – just a few mates and an adventurous attitude. We have a trusty steed in the form of our 28ft mono hull boat "King Julien", named after the ring tailed lemur in the hit animation movie "Madagascar". While King Julien is first and foremost a walk-around fishing boat designed for popping, spinning, jigging and fly fishing, it does boast a cleverly constructed cabin under the console and sufficient hatch space to allow four of us to live fairly comfortably for as long as our food, water and fuel lasts. However it's still very much a case of roughing it. Luxuries in any shape or form do not exist and, and it's always a pretty dirty boat and feral crew that arrive back at the end of a decent day DIY trip. Having done a number of these trips over the last couple of years, we've become quite adept at making a mountain of gear magically disappear into King Julien, and have worked out a pretty good system of eating, sleeping and fishing without either of those three critical aspects impacting on one another. Running a tight ship is crucial when four smelly men are living in very close proximity to each other for long periods of time! On this particular trip we had been eyeing out some interesting looking mangrove estuaries and islands in the south, and had a rough route planned out that encompassed a variety of fishing terrain. Madagascar is best known for popping and deep jigging for GT's and dogtooth tuna on offshore reefs, but because we do a lot of that sort of fishing with our clients, on this voyage of discovery we were more focussed on the often overlooked lighter side of Madagascar. 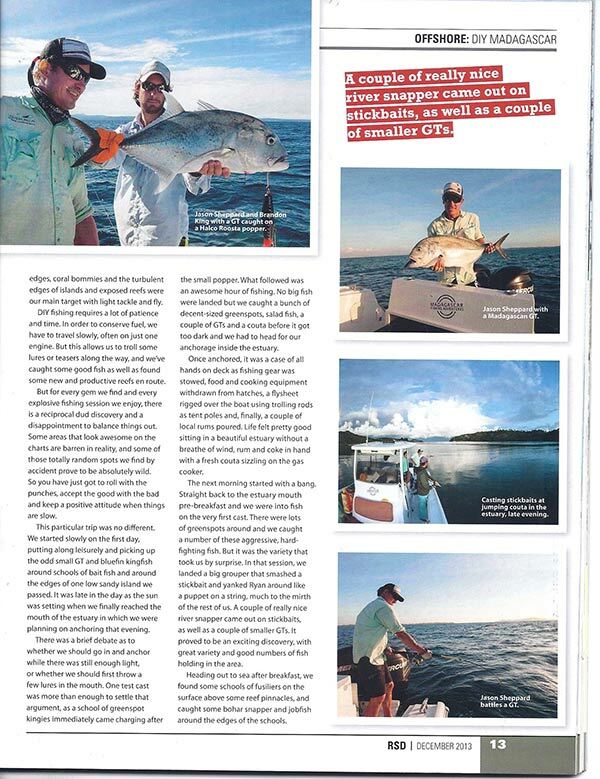 Estuaries, inshore reef edges, coral bommies and the turbulent edges of islands and exposed reefs were our main target with light tackle and fly. DIY fishing requires a lot of patience and time. In order to conserve fuel we have to travel slowly, often on just one engine. But this allows us to troll some lures or teasers along the way and we've caught some good fish as well as found some new and productive reefs en route. 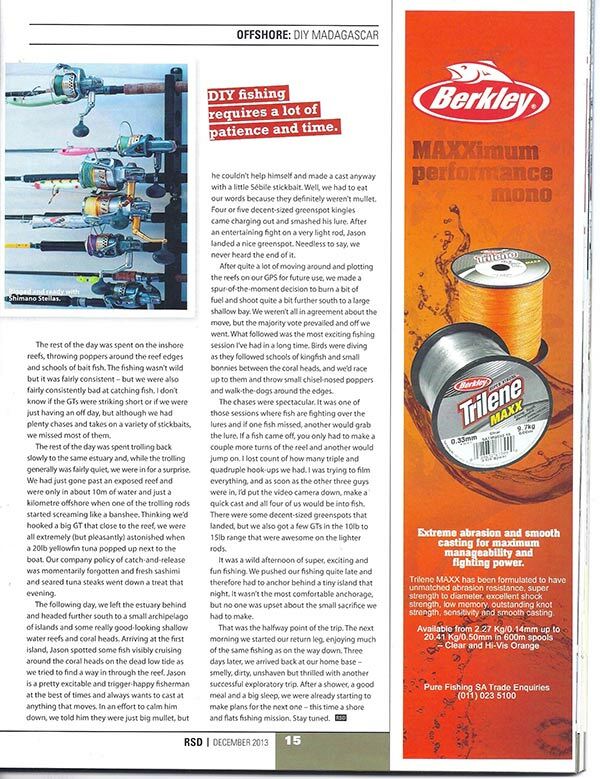 But for every gem we find and every explosive fishing session we enjoy, there is a reciprocal dud discovery and a disappointment to balance things out. Some areas that look awesome on the charts are in barren in reality, and some of those totally random spots we find by accident prove to be absolutely wild. So you have just got to roll with the punches, accept the good with the bad and keep a positive attitude when things are slow. This particular trip was no different. We started slowly on the first day, putting along leisurely and picking up the odd small GT and blue fin kingfish around schools of baitfish and around the edges of one low sandy island we passed. It was late in the day and the sun was setting when we finally reached the mouth of the estuary we were planning on anchoring in that evening. There was a brief debate as to whether we should go in and anchor while there was still enough light, or whether we should first throw a few lures in the mouth. One test cast was more than enough to settle that argument as a school of green spot kingies immediately came charging after the small popper. What followed was an awesome hour of fishing. No big fish were landed but we caught a bunch of decent sized green spots, salad fish, a couple of GT's and a couta before it got too dark and we had to head for our anchorage inside the estuary. Once anchored it was a case of all hands on deck as fishing gear was stowed, food cooking equipment withdrawn from hatches, fly sheet rigged over the boat using trolling rods as tent poles, and finally a couple of local rums poured. Life felt pretty good sitting in a beautiful estuary without a breathe of wind, rum and coke in hand with a fresh couta sizzling on the gas cooker! The next morning started with a bang. Straight back to the estuary mouth pre breakfast and we were into fish on the very first cast. There were lots of green spots around and we caught a number of these aggressive hard fighting fish. But it was the variety that took us by surprise. In that session we landed a big grouper that smashed a stickbait and yanked Ryan around like a puppet on a string, much to the mirth of the rest of us. A couple of really nice river snapper came out on stick baits, as well as a couple of smaller GT's. It proved to be a really exciting discovery, with great variety and good numbers of fish holding in the area. Heading out to sea after breakfast we found some schools of fusiliers on the surface above some reef pinnacles, and caught some bohar snapper and job fish around the edges of the schools. The rest of the day was spent on the inshore reefs, throwing poppers around the reef edges and schools of baitfish. The fishing wasn't wild but it was fairly consistent - but we were also fairly consistently crap at catching fish! I don't know if the GT's were striking short or if we were just having an off day, but although we had plenty chases and takes on a variety of stick baits, we missed most of them. The rest of the day was spent trolling back slowly to the same estuary, and while the trolling generally was fairly quiet, we were in for a surprise. We had just gone past an exposed reef and were only in about 10 meters of water and just a kilometre offshore when one of the trolling rods started screaming like a banshee. Thinking we'd hooked a big GT that close to the reef, we were all extremely (but pleasantly) astonished when a 20lb yellowfin tuna popped up next to the boat. Our company policy of catch and release was momentarily forgotten and fresh sashimi and seared tuna steaks went down a treat that evening! After quite a lot of moving around and plotting the reefs on our GPS for future use, we made a spur of the moment decision to burn a bit of fuel and shoot quite a bit further south to a large shallow bay. We weren't all in agreement about the move, but majority vote prevailed and off we went. What followed was the most exciting fishing session I've had in a long time. Birds were diving as they followed schools of kingfish and small bonnies between the coral heads, and we'd race up to them and throw small chisel nose poppers and walk-the-dogs around the edges. The chases were spectacular. It was one of those sessions where fish are fighting over the lures and if one fish missed, another would grab the lure. If a fish came off, you only had to make a couple more turns of the reel and another would jump on. I lost count of how many triple and quadruple hook-ups we had. I was trying to film everything, and as soon as the other 3 guys were in, I'd put the video camera down, make a quick cast and all four of us would be into fish. There were some decent sized green spots landed, but we also got a few GT's in the 10 – 15lb range that were awesome on the lighter rods. It was a wild afternoon of super exciting and fun fishing. We pushed our fishing quite late and therefore had to anchor behind a tiny island that night. It wasn't the most comfortable anchorage but no one was upset about the small sacrifice we had to make. That was the halfway point of the trip. The next morning we started our return leg, enjoying much of the same fishing as on the way down. Three days later we arrived back at our home base, smelly, dirty, unshaven but thrilled with another successful exploratory trip. After a shower, good meal and big sleep we were already starting to make plans for the next one – this time a shore and flats fishing mission. Stay tuned.